Gusto, a billion dollar HR software company, has written about the feature prioritization template they use to help make "Apples to Oranges" weigh product decisions with vastly different end goals. The result is a 'Product Prioritization Matrix' that plots Customer Expectations on the X-axis and Customer Impact on the Y-axis. Neat features rate high for unexpectedness and low for impact. Customers may like it but it is not essential to their end goals. 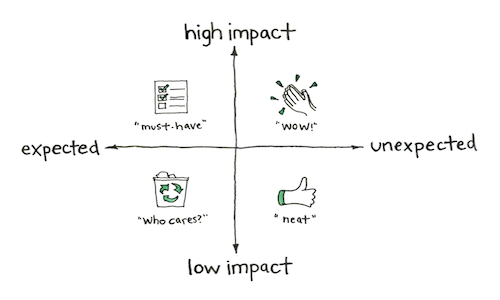 Wow features rate high for unexpectedness and high for impact. These features are a necessity for the customer, and if they are missing, could prevent customers from using your product. Must-Have features rate low for unexpectedness and high for impact. This might be something the customer has never seen before and becomes essential to their workflow. Who Cares? features rate low for unexpectedness and low for impact. These are features that you may strive to remove from the workflow completely.